History: 5 year old boy with left scrotal pain. Epididymitis Orchitis: Grayscale ultrasound through the scrotum reveals asymmetric swelling and hypoechogenicity of the left testicle and epididymis. 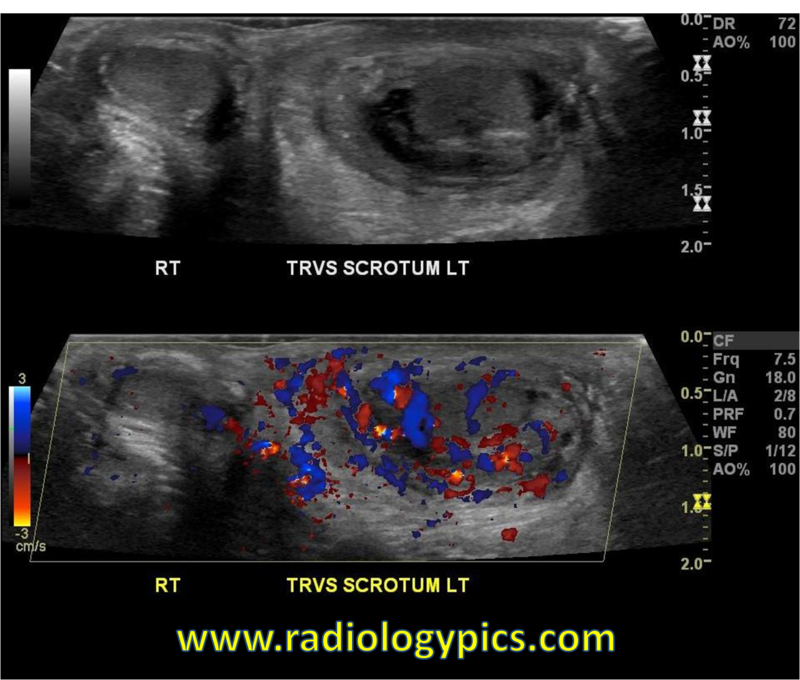 Doppler color ultrasound reveals increased flow to the left testis and epididymis, compatible with epididymitis-orchitis. This is a case of epididymitis-orchitis, which is also referred to as epididymoorchitis or acute scrotum. Epididymoorchitis is an infection of the testicle and epididymis. Orchitis alone is much less common. Ultrasound is the gold standard of diagnosis, and it classically appears as hypoechoic enlargement of the testicle and epididymis with increased flow on doppler color imaging. The differential diagnosis for this appearance are epididymitis, epididymoorchitis, testicular or epididymal torsion, and traumatic testicular/epididymal rupture. Epididymitis and orchitis are commonly caused by retrograde bacterial seeding, and are more common in kids with genitourinary malformations such as ectopic ureter, prostatic utricle, posterior urethral valves, urethrorectal fistula, or vesicoureteral reflux.